Jim and Barb's RV Adventure: Where is Everybody?!?!?! As we wrap up our final week here in North Dakota I look out our window with a view of snow and mud. Rain and snow made for some muddy ground! The songbirds have gone south, most of the ducks have gone south, and according to Facebook RVillage and blog posts, it seems our fellow fulltimer friends have migrated south as well. They seem to be posting pictures of warm weather, happy hours, hikes in the desert and relaxing in a chair while fishing on a beach. Where are all these people? Well they certainly aren’t in North Dakota! Out of curiosity I went through to see where each of them were and this is what I came up with. It appears we are the only star in North Dakota. In fact, there does not seem to be anyone within a 1,000 miles of us! We were not able to indicate where everyone is as some of our friends post there locations in arrears while others are running from the law and we are sworn to secrecy. Dino and Lisa go from “undisclosed location” to another “undisclosed location”. Although we know where they are and listed them on the map below we feel it is okay as the reader will never know which one of the stars is theirs. I will tell you however, we are GREEN with envy that they are enjoying warmer weather than us! Meanwhile back at the farm the field work has come to a standstill as it is just too wet to do anything. Instead we have been busy with deer hunting and other projects. Barb continues to be crafty with her projects. In fact she has graduated from crafter to woodworker when she took an old barnwood door and made it into two tables; one for the top of the dog crate and another one to replace our existing dining room table. The old nails were left in place, she used 3/4" black pipe for the legs of the table and ordered some stools from Wayfair to replace the existing chairs. We left the old table and chairs in a storage loft here at the farm. In fact the Finken's probably don't even know we left them there so mums the word! She also finish the picture frame she has been working on. We have a picture of a horse that is a twin to a buckskin she used to have. We had it hanging in the bedroom but the old frame broke a month ago so she wanted to make a new one. It too turned out great! Barb also got out to another cooking class with Jeanie. This one was an eggroll class and is even better then the lefse class she went to a couple weeks ago! We also got out to dinner to Ebeneezer's in Minot with Bob and DeAnne. It was good but not as good as DeAnne's homemade Fleischkuechle she made a couple days later! Meanwhile I have been trying to fill my hunting for a wily whitetail trying to fill my bow tag. Patiently waiting for a big buck! We have quite a few cameras scattered throughout the area trying to find the big guys and although we are seeing some nice bucks I thought I would share some of the more interesting pictures that we captured over the past couple weeks. That's a lot of birds! Some bucks just don't know how to take a selfie! With single digit lows forecasted for tomorrow night it is time for us to move on. Looks like I need to do a little chipping around the jack pads! 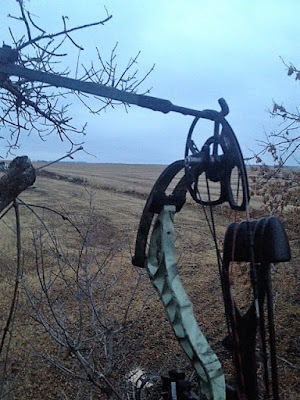 Despite my best efforts the big bucks eluded me in North Dakota for the 2nd straight year but with luck there will be other opportunities on our travels this winter. It is always hard to leave the farm, we will miss Bob, DeAnne, Chris, Holly and Dylan (as well as Gavin and Chase) but it is always easier when we are forced to leave due to weather. It is now time to head to warmer climates as we are headed to Florida! By way of Indiana and Pennsylvania.....Wait, what?!? Yes we are headed more horizontally across the country for now rather than south. We are heading to Elkhart for an appointment then on to Pennsylvania for Thanksgiving with our daughter and family. We should make it to Florida sometime in late December/early January and by then I am guessing we will be welcoming the warm weather! Do you not know the meaning of undisclosed? Barb is turning out to be pretty handy in more ways than one it looks like. That deer selfie should be your profile picture. Safe travels and I hope you get your jacks shipped out. What? We did not tell anyone which star is yours so you should be safe! Safe travels and I am sure you will be "thawing out" in warm weather soon. Thanks! Although you will not be traveling this winter I bet you are going to enjoy your new digs! Nice, I think she has given up on that! You know we live and travel in RVs so we can avoid that white stuff, right?? I'm glad you crazy people are finally heading south. Enjoy Florida this winter, we're heading back to AZ on Saturday and looking forward to another winter in the desert. We haven't even left yet and we are already going to miss not being in Quartzsite this winter! So glad NO ONE knows where your friends are! I can't imagine why you are the only star in the north. The temps look so inviting in ND:) Hope you are chipped out and on the move. We'll keep our fingers crossed that the weather stays mild while you drive east by the northern route. Barbs barn door tables are beautiful! I love the old door look. My parents had a kitchen table and coffee table made from old ship hatch doors. Great frame idea for the photo. Safe travels to PA. Say hi for us! Ship hatch tables would be awesome! The weather looks like it will cooperate with our trip out east so hopefully it will all go well! We are planning on hitting Hersey and Gettysburg for sure, not sure what else. Open to suggestions! You guys sure like to chance the weather! Barb sure has been expanding her talents...nice job on the table. We’re sure going to miss not having our beer tasting buddies in Q. It will be hard but it looks like you will have to find a couple of stand-ins for us in Q this winter. Now, if you could just find anyone who likes to drink beer?!?!? What were you doing in the bedroom that broke the old frame? Tables look great! I wish I knew, I came back from the farm field and Barb said it just fell off the wall! That buck picture is hilarious. Barb sure has talents and her creations are beautiful. I wouldn't have thought of making a picture frame from that wood and admire her creativity. Nice jobs. Those temps you are experiencing would make me run pretty fast to somewhere I can go outside without goosebumps. Florida sounds nice to me. He certainly was a curious buck! Now that she has a taste of wood working she is already talking about doing more and getting her own table saw! The 10 day forecast in Pennsylvania shows highs in the 50's, we will take it! Great job Barb!!! We're all just not as crazy as you two, this girl doesn't do cold if she can help it. Hopefully our paths will cross this winter. We are planning to come through Texas on our way back to South Dakota. At this point we are not planning on swinging that far south but who knows?!?!? You had me at "Where is everybody?" Thanks for letting us know about the Green Star location. Dino and Bambam stuck us with a bill for brats and grilled onions once at the Tampa RV show and they have been in "Undisclosed locations" ever since. Ya gotta watch those two nomads. Come on down to the sunshine state. The sun is shining and it really does feel good. That is just like those two and exactly why they are on the run. Rumor has it they might be traveling back that way this winter so maybe, if you are really tricky, you can stick them for the bill this winter! If you get to the Tampa RV show, I may just give you a free tram ride. But I am making no promises. LOVE the tables! Very nice! Great job Barb! Hope to catch up with you guys at some point! Thanks, we are very happy with them as well! Im impressed Barb is also handy with tools, making frames and tables in addition to her already many talents. I like that frame, its simple but very creative. I will keep an eye on where you are headed, currently we are in SC for Betsy's maintenance, then to GA and ultimately to FL in December. Who knows our paths might cross. That would be awesome! Our next committed destination is Yankeetown in early January. We have not picked our route down there yet, as much of it will probably depend on the weather. The star map is funny. You're waaaaay up there! Glad we don't have to worry about running into you-know-who. I've heard stories! The bird photo is great! Love the buck too. Barb never ceases to amaze me! Dang those tables are fantastic! She could build some and ship them out! Sorry we'll miss you in Q but we hope to get up to SD/ND this summer. Hopefully we can see your place if you're there. We put a star for you guys in Reno, not sure if you were still there but that was your last known location. Let us know if you make it up to the Dakota's, it would be great to see you guys!